Need help with the English language? Adult Learning Classes on offer!! 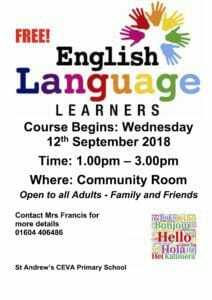 St Andrew’s are pleased to be able to offer Adult Learning Classes during term time, and after a very successful course last term, Family English classes are starting on Wednesday 12th September. This course offers speakers of other languages the chance to improve speaking, listening and writing in English; help you use English in your everyday life; and skills to help you communicate with your child’s school. This course is on offer to not only parents/carers of pupils at the school, but friends, family, colleagues – and it is FREE!! !